In 1963 the society magazine 'Control Column' started to be produced monthly to provide better grapevine between members. 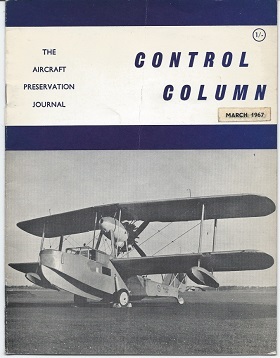 In 1967 'Control Column' was offered as a national magazine and met with instant response from a number of Societies who accepted it as their house magazine. Through these pages new contacts were established and through it the first moves were made towards a co-ordinating body wherein all groups sharing this common interest might also share ideas and integrate policies without conflict. These moves were totally successful and the British Aircraft Preservation Council was created. Later the name was changed slightly to the British Aviation Preservation Council to reflect the wider movement. BAPC is now well established. Financial problems compelled us reluctantly to hand over production of 'Control Column' to others.